The March edition of my monthly monster-building column, No Assembly Required, is now posted at This Is My Game. The column, No Assembly Required, features a monster that can be inserted into a Dungeon & Dragons 4th Edition campaign. Each monster in the series includes comprehensive information including Origin, Lore, Combat Tactics, Power Descriptions and Stat Block. Visit This Is My Game to review this month’s monster, Weta Swarm. The Weta Swarm is an Heroic-Tier monster who can serve as a pesky creature and hopefully adds more “swarming” flavor than other monster options. The Weta Swarm was inspired by my recent travels to New Zealand. I have thought about creating a swarm monster in the past because I often find that the current swarm options do not feel all that “swarmish.” Other than taking half damage from melee and ranged attacks, many swarms simply feel too much like other monsters. 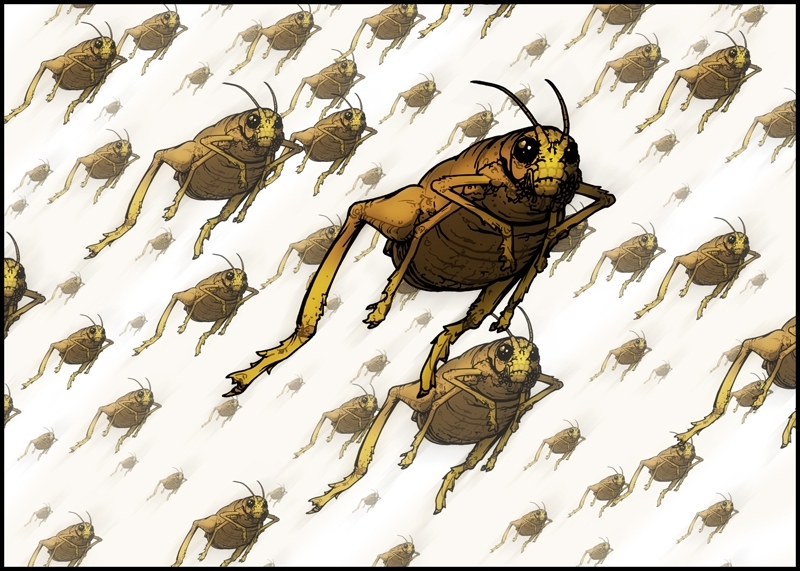 It was my intention to make the Weta Swarm feel like a significant threat just by sheer numbers alone. As always, I’m open to feedback so please post any questions or comments about the monster here or at This Is My Game, and come back next month for another ready-to-use monster. The fantastic artwork is provided by Grant Gould. Visit This is My Game for the full description of Weta Swarm. This entry was posted in No Assembly Required and tagged D&D, Dungeons & Dragons, Gaming, Monster Building, New Zealand, RPG, Weta. Bookmark the permalink. Hey there! So I stumbled upon your blog and I have to say I love your No Assembly Required pieces. My friends and I are avid DnD players and I have a friend who DM’s a game every Sunday for us. I was wondering if I could ask, are these builds available for anyone to use within their campaigns? I think my friend would absolutely enjoy some of the ones you’ve created on your column and I’d like to share this blog with him so he can check it out and possibly enhance our DnD nights! Thank you for stopping by and commenting. The information presented for the monsters is certainly available for use in a home campaign. That is the specific reason I am posting them – for others to use. You can tell your friend to feel free to print out the information on the monsters and edit anything that he wishes to change. Enjoy, and I’d be happy to hear how the monster(s) play in your game.